Suggesting visions during this project sometimes leads me to feel like I am portrayed in the above quote. Here is an informal blog with some recent information about La Marqueta happenings. The gist of the article reviewed fond memories of La Marqueta, and makes the obvious point that the market today fails to evoke the same feeling for those returning to the market. However, what the author left open was a dialog considering what the market will be resurrected as. What is the point? Who are the customers? Who benifits? Frankly, the market as it exists now fails for two reasons. One the prices are too high. Secondly, the design of the market is too indicative of the actions, and the lifestyle of a specific Customer. 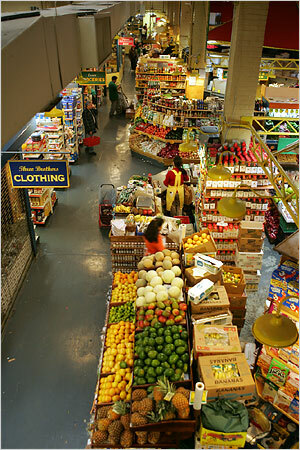 Simply, themes in the architecture and visual design targets groups of people who are not native to East Harlem. The fenced in area of La Marqueta is a maze of red fences. Fences that facilitate vending in specific areas, and keep locals out at night. Remember there is only one way through a maze, in this case North to South. Another visual analogy one might use would be a zoo, If you walk forty feet west of the fenced in market, all you see is a red fence with the heart of Harlem’s culture flowing in one direction thorough it. A majestic sight watching culture contained in a red fence, for tourists perhaps. Indicative infrastructure such as the red fence creates a sense of containment for Harlems culture. As though it could be caged, or contained. What was successful about past attempts was the lack of indicative architecture and design. Simplification. 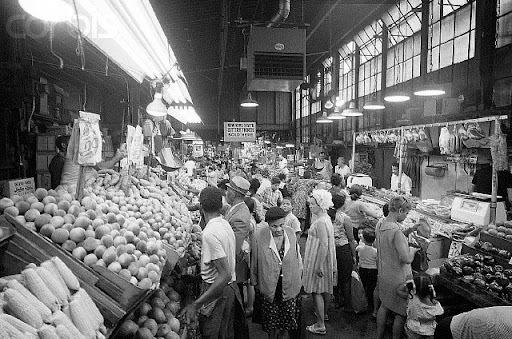 I can however propose the deregulation of the market for Harlem Residents, and reconsider the application of ideas proposed in Brown’s work, which is in a previous post.